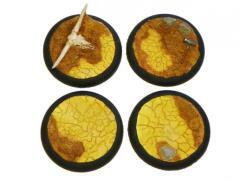 These quality 50mm Lake of Sorrows resin bases create a dry lake bed desert scenic environment each with different dried and broken earth with sandy or rocky edges. They are well suited for use with all gaming miniature products in any game setting including fantasy, sci-fi, cyber-punk, etc. They are an excellent choice for Warmachine or Hordes army commanders seeking to set their troops apart of create a unique setting for their troops or to create a unique backdrop for that special miniature for D&D, Pathfinder, or any other role playing game. This item includes 2 randomly selected 50mm lake of sorrows bases. As with all of ForgeCraft Games resin parts, these 50mm resin bases are precision pressure cast for void free castings. This set is produced in the USA and is delivered as gray cast unpainted bases and may require some very minor flashing removal and cleaning prior to painting.